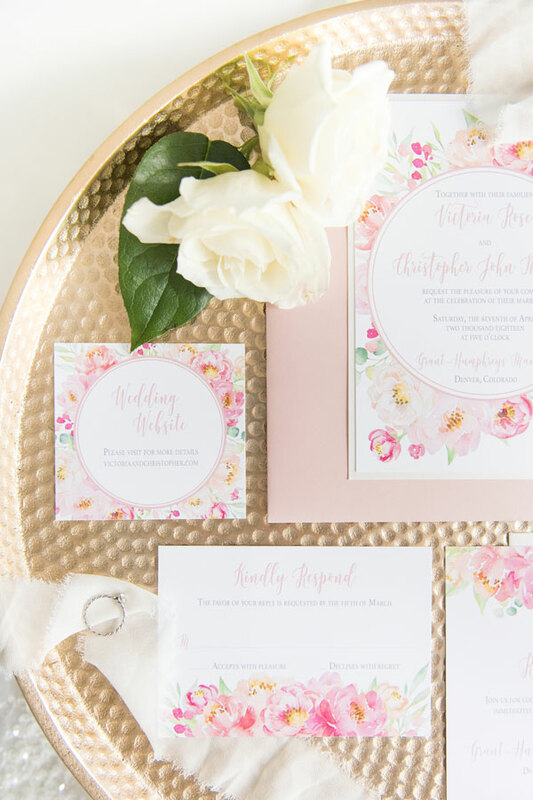 The Victoria Rose Suite is a floral watercolor wedding invitation suite filled with peonies in hues of pink and coral circled around the words inviting your loved ones to your wedding day celebration. You can customize this wedding invitation suite by changing the colors of the font, envelopes, and paper to fit your wedding vision. Pictured here, the Victoria Rose Wedding Invitation Suite has been customized with a light shimmer cardstock accent layer and pink envelopes. But add a ribbon or pocket for a custom look just for your special day!